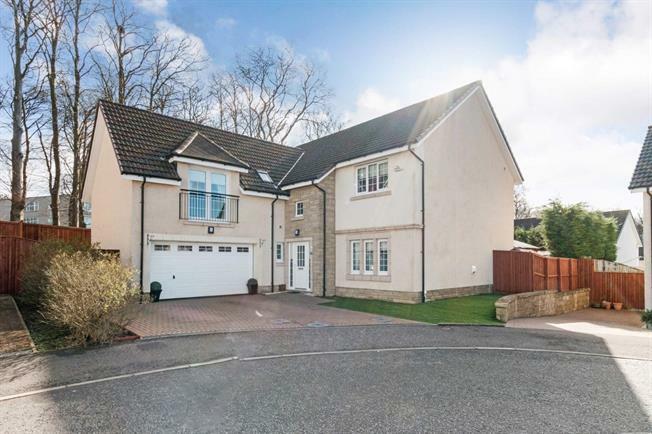 5 Bedroom Detached House For Sale in Motherwell for Offers Over £440,000. Spectacular Cala built "Melville" design extended and upgraded to an exacting standard. This "L" shaped model enjoys a premier position within the development and provides flexible accommodation over two levels including: broad reception hall, WC, dual aspect lounge, formal dining room, refitted kitchen with open plan family room and utility room. The substantial extension provides a vast sun room offering additional dining and entertaining space. The galleried landing leads to five generously sized bedrooms, master and guest with en-suite facilities and family bathroom. The high specification finish includes lavish decoration with quality carpets and floor coverings, double glazing and gas central heating. The wonderful garden grounds offer a high degree of privacy with artificial lawns and an expansive driveway leading to the integral double garage while a hot tub and sauna is located within the summer house. The development is ideally placed for preferred primary and secondary schooling, town centre and train station.